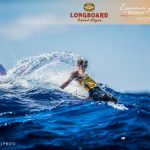 Australia’s Jordan Mercer gets the nickel in her fifth straight win, two newcomers claim championships in their first crossings of the Molokai Channel and SUP sees two athletes claim their second titles. Honolulu, HI (July 26, 2015) – Crossing the Molokai Channel is never an easy task, but today’s 19th annual Molokai-2-Oahu Paddleboard World Championships (M2O), presented by Kona Brewing Company produced exceptionally challenging conditions, forcing each athlete to battle for their spot at the finish line. Relatively calm conditions on the Molokai Channel turned to pounding south swell that created massive waves approaching the finish at Portlock Point. In the end, Australia again dominated the overall leaderboard. Two paddleboarders claimed championships in their first outing across the channel. 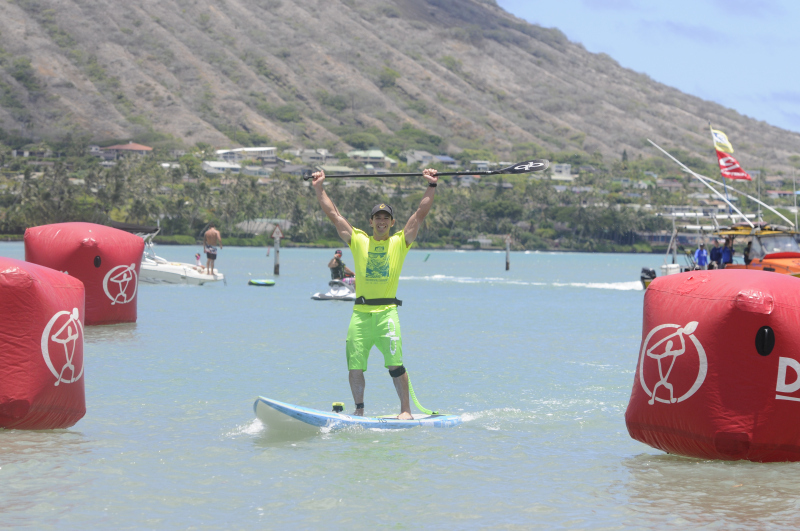 The SUP division saw strong performances by two athletes who claimed repeat championships from Germany and Maui, and another who claimed his second title in three years. In what she called a grueling paddle, Australia’s Jordan Mercer got the nickel in her fifth straight victory. The 21-year-old powerhouse has repeatedly dominated the women’s unlimited paddleboard race, finishing in a time of 6 hours, 9 minutes, 19 seconds. On the men’s side, newcomer Matt Bevilacqua, 23, from Australia surprised the men’s field with his victory in his first attempt at crossing the Molokai Channel (5:20:13). 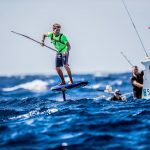 The men’s stock paddleboard race saw a new champion Sunday who also experienced his first crossing of the Molokai Channel. Kendrick Louis of Australia, 25, was part of a competitive stock race, featuring former champions Jack Bark and Zeb Walsh. Louis bested Bark by just over a minute in today’s competition, finishing in 5:52:08. Australia’s Jordan Mercer got the nickel in her fifth straight victory. The 21-year-old powerhouse has repeatedly dominated the women’s unlimited paddleboard race, today finishing in a time of 6 hours, 9 minutes, 19 seconds. Germany’s Sonni Honscheid claimed her second women’s unlimited SUP championship in a repeat performance with a time of 5:53:18. Australian Travis Grant, 32, wins his second stand up paddleboard (SUP) championship at M2O in a time of 4:59:38. Colleen Tessler, 36, from Oahu won the women’s stock paddleboard race in a time of 7:11:20. 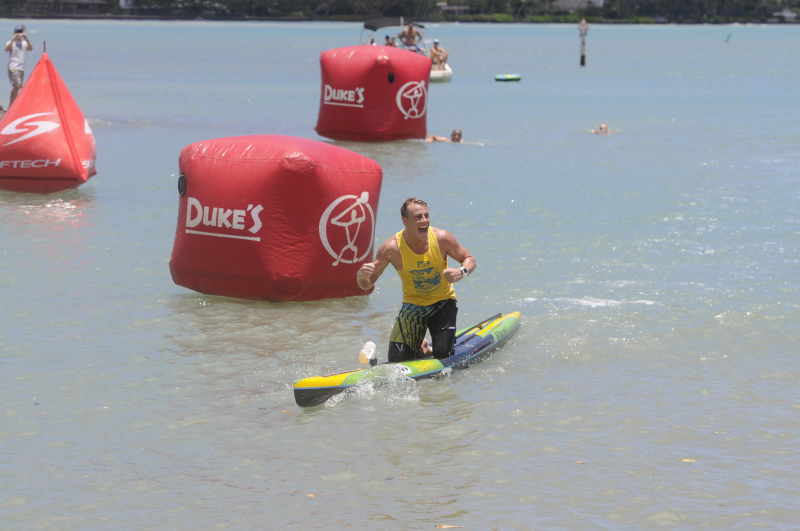 Australian Travis Grant, 32, won his second stand up paddleboard (SUP) championship at M2O in a time of 4:59:38. Grant appears to excel in tougher conditions. 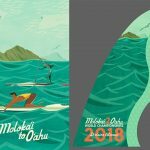 His previous victory in 2013 was just nine minutes faster in a year when conditions in the Molokai Channel also made the athletes work harder for the finish. Maui’s Travis Baptiste, 18, rounded out the men’s SUP division with his third championship in the stock category at M2O in a time of 5:26:47. 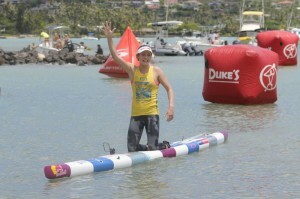 Germany’s Sonni Honscheid claimed her second women’s unlimited SUP championship in a repeat performance. Honscheid had the likes of former champions Terrene Black, Andrea Moller and Jenny Kalmbach to manage, but her time of 5:53:18 was good enough to seal the deal. Honscheid was chased all day by New Zealand’s Annabel Anderson, 36, who took second overall in the women’s SUP division on a stock board. 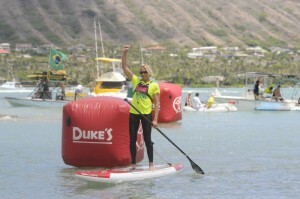 Anderson’s time of 5:57:40 earned her the championship in the women’s stock SUP category. For complete results and more race information, please visit Molokai2Oahu.com. Valued M2O partners include (alphabetically): Bio Astin, Bluerush, Chosen, Dr. Danger, DotVision, Duke’s Waikiki, Futures, Garmin, GoPro, Hawai’i Tourism Authority, Kona Brewing Company’s Longboard Island Lager, Kona Red, Maui Jim, Ocean Paddler, Patagonia, Standup Paddle Magazine, Surftech, Watermans Applied Science and WND & WVS. 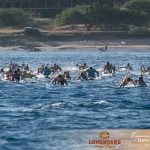 The 19th edition of the Moloka’i-2-O’ahu Paddleboard World Championships (M2O), presented by Kona Longboard Island Lager, is set for Sunday, July 26, 2015. 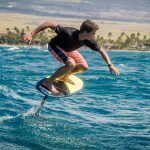 Founded in 1997, M2O has grown from a grassroots challenge for the legendary lifeguards of O’ahu to the premiere event in the sport of paddleboarding. The race annually crowns world champions in the two disciplines of traditional (prone) and stand-up (SUP) paddleboarding. Connecting the islands of Moloka’i and O’ahu, the 32-mile race crosses the Ka’iwi Channel, also known as the Moloka’i Channel. Men and women from more than 20 countries will face strong currents as they navigate the fastest downwind-route over one of the most beautiful and powerful channels in the world. Top athletes can complete the crossing in less than five hours, riding mid-channel waves that crest more than 12 feet and carry paddlers hundreds of meters. M2O starts on Kaluakoi Beach on the northwest shore of Moloka’i and finishes in Maunalua Bay on the southeast shore of O’ahu. The annual race is a deeply personal experience, challenging every paddler’s physical and mental endurance. Every finisher experiences an individual championship.